WHERE: Keswick, English Lake District. WHAT: a pair of Spring lambs. MAPS: Keswick, and Abbotsford. Thumbnail click pops-up larger image. In celebration of the Spring in full swing in these latitudes, albeit thousands of miles east of here and notwithstanding the dark * mutterings of Lady Scott, we decided to feature this picture of lambs in the English Lake District, taken from Ann Bowker's web site. The UK CAM sites [available from the pulldown menu in the page sidebar] are recording all the expected delights of this season of new life. From snowdrops, through primroses (our own favorites) and crocus, to daffodils and cherry blossom, the CAMs bring visual pleasure; later in the year the intoxicating perfumes of the flowers or blossoms of honeysuckle, elder, and hawthorn will require deprived desert dwelling expatriates to exercise their imaginations. After a short divertissement over Easter, on Tuesday we will return to the subject of the non white contribution to the development of the Old West. The first subject will be a remarkable man who was never paid his contractual dues for a pioneering task, and had to wait 145 years to be formally acknowledged by the town that defaulted. * One spring, while strolling through their Abbotsford estate, Sir Walter and Lady Scott passed a field replete with gamboling lambs. 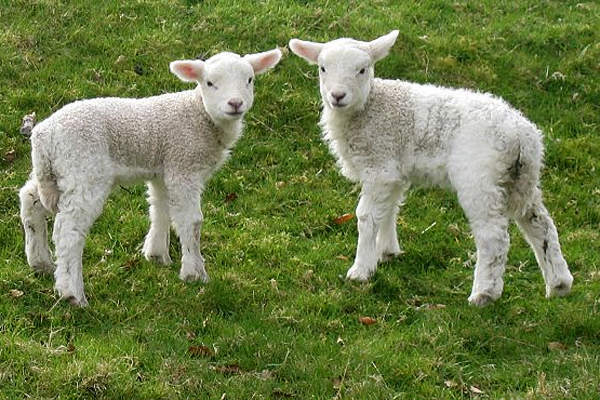 "No wonder," Scott remarked, "that poets from the earliest times have made lambs the symbols of peace and innocence." "Delightful creatures indeed," Lady Scott replied, "especially with mint sauce." Sir Walter Scott (1771-1832) Scottish novelist.